SD7082 : Green Hill - the summit of Lancashire? Green Hill - the summit of Lancashire? 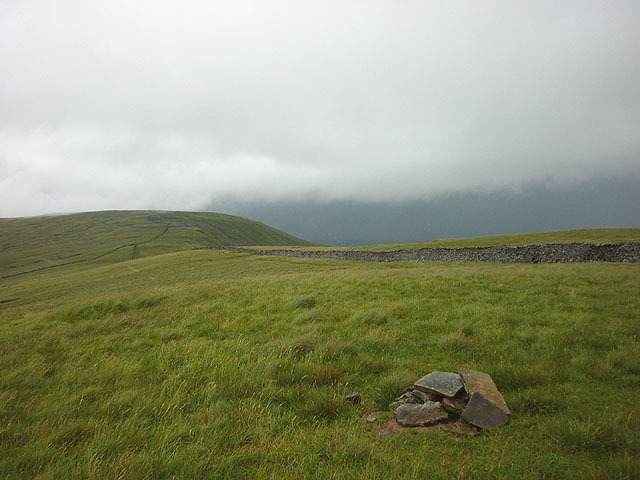 A small cairn sits roughly about where the 628m spot is just west of the county boundary wall. According to maps this is now the highest point in Lancashire (certainly since 1974 when the detached portion of the county that comprised Furness and part of the Lake District was subsumed into Cumbria). Gragareth, a little further south along the ridge has a 627m trig point but from here actually looks higher (possibly an optical illusion). There are various lumps and bumps in this region that may actually be higher than here. This is the view looking north towards Great Coum (Cumbria) - if only the politicians had extended Lancashire a little further this would have made a much more inspiring county high point! The apex of the drystone walls is the most northerly point of Lancashire where the County Stone Link sits.